On December 12, 1968, Pan Am Flight 217, a Boeing 707, crashed near Caracas, Venezuela and all 51 passengers on board were killed. One of the crew members – an air stewardess as they were then called – was Franciska Buyers who must have been 23 years old at the time. All this came to mind yesterday when I happened to google, as I some times do, trying to locate people I used to know when I lived in London as a student in the sixties. I was searching for Anton Buyers, Franciska’s younger brother who was a student at Cambridge University when she was killed. I did not locate him but when I did a search relating to the circumstances of the crash of Pan Am 217, lo and behold, I found several references to that ill-fated flight. In fact, I did not know the flight number but knew that it crashed near Venezuela towards the end of 1968. So why am I writing about Franciska – she was not an old flame though she was a friend. But only three of the victims of the crash were named in the google searches that I did – there was no mention of Franciska and I decided that, with this posting, I would remedy the situation. The named victims – sometimes an almost cursory mention – included a moving account by, Brian, the son of the first officer on the flight, William Canell who was only eight months old when his father was killed. There was mention of the name of the captain, Sid Stillwaugh. Finally, a reference to one of the passengers Olga Antonetti, a former Miss Venezuela. I did finally locate mention of Franciska’s name in the St. Petersburg Times, dated December 14, 1968, available on the web = though itis not something that would surface in most searches. Also mentioned are other names including stewardess trainee M. Ambrey who was believed to be on her maiden flight in her new role. Other victims names also appear in this newspaper report. 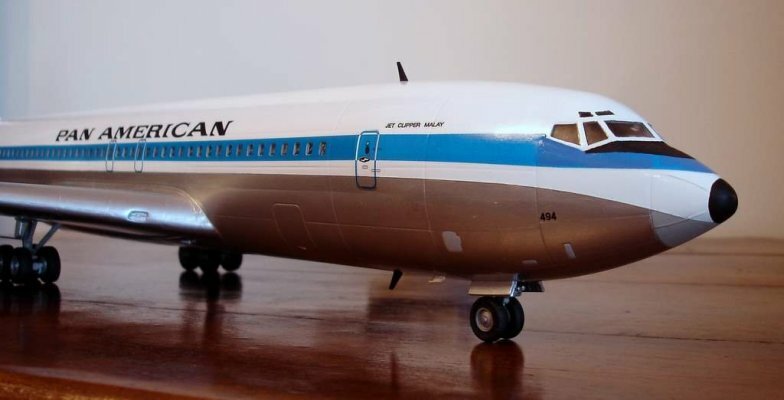 Brian Cannell, the son of the first officer on the flight, in a gesture of remembrance of his father, constructed a model of the Boeing plane complete with its “Clipper Malay” name – a couple of images appear below. I lived for about 18 months with the Buyers family in Highgate, London, in the early sixties, as a paying guest – I was then a student. I rented a single room and was provided my meals and was, for all intents and purposes, part of the family. Another paying guest was Sethi, an Egyptian doctor, in his thirties, who was doing some sort of specialization. The parents, Jimmy and Drucie were an unusual English couple. For one thing, they were both communists and, not surprisingly, they were atheists. Drucie, interestingly, had a sister who was married to a well known physician who were both very conservative and the polar opposite of Drucie. Jimmy had been a first violinist with the London Philharmonic Orchestra and had played with some famous conductors in his time with the orchestra. They were very good to me and we had numerous discussions on politics and other issues of the day – they treated me like a son. Even after I moved on, I would keep in touch with them and visit them from time to time. One of the striking things – at least striking to me at that time – was that Franciska and her brothers Anton and Gordon, called their father by his first name, Jimmy. Later, in “To Kill a Mocking Bird”, we of course have Atticus Finch addressed by his first name by his daughter Scout. I recall asking Franciska how it ever came about that she called her father by his first name and she told me that it was her father who wanted it that way. Franciska and I were about the same age and so we hit it off pretty much right away. We tended to hang out – saw several movies together including West Side Story and Lawrence of Arabia. She applied to become an air stewardess with Pan Am based in New York in 1967. She was surprised and excited when she was offered the job – this was in an era when being an air stewardess was associated with a certain element of glamor since traveling internationally was not something that many people did. Thereafter, I would see her from time to time when she visited London on her various travels around the world. She told me of her involvement with a guy from Florida whose first name was Kit and later around the time she was killed, she was involved with some guy in New York in what seemed a serious relationship. I was in India when the plane crash occurred and I heard about it upon my return when someone who knew of my friendship with Franciska called me to let me know what had happened. I was shocked and in a state of disbelief. I went to see her parents to offer my condolences. They were remarkably composed and seem more bothered by how it was affecting me than anything else. They told me that it was a suspected case of sabotage and that Franciska’s body had been recovered but they told Pan Am that they did not want to see the body and asked that they not be part of any funeral or burial. They did not even know where she was buried – and had no wish to know. It may sound callous but it really was not – they told me they wanted to remember her the way they knew her when she was alive and given that they did not have any religious beliefs, the burial and any related related service of worship was of no importance. The cause of the crash was never established – the crash occurred at a time when “black boxes” in planes were not in use. The rumor of sabotage as its cause seems to have been superseded by suggestions of pilot error. I would assume that her parents have passed on since they would be over a hundred years old today. I have no idea where her brothers are today. Gordon, the older brother was in the British army when I knew Francsika and Anton was at Cambridge University. The unusual spelling of Franciska’s name was because her mother wanted it that way – she gave me some reason for it but I don’t recall what she said. This entry is a cyber-memorial of sorts to Franciska – if anyone does a search for her name, they are likely to reach this website. This post has been updated here. It includes an image of Franciska and her friend, Katherine Kane, who was also a flight attendant with Pan Am. ADDENDUM I: A New York Times article listing all the passengers and crew on this flight was recently provided to me by Jill Breitbarth. I was the Kit in your narrative. A sad day indeed. Thanks Rana for keeping this page open, it’s somewhere to go on this day. I echo Brian’s sentiments. Thank you, Rana, for providing such a special place for those of us who remember and miss and still love the people on board flight 217. Brian & Jill, I am glad that this blog is a refuge of sorts on each anniversary. I plan on keeping it open as long as I am around! It is amazing to think that 48 years have passed since this tragedy. Roxanne, I emailed you separately. Thanks for the detailed and moving account about Marianne. I will be pleased to include a picture of her if you email it to me. Roxanne’s comment about wanting to include a picture of her friend Marianne makes me wonder if there are others who lost loved ones who would like to have a picture included. If there is sufficient interest and responses, I will be happy to dedicate a page specifically for such pictures and, perhaps, a few words of introduction to the person being remembered. TJ. thank you for this page. it’s been a great interest to read all the comments and learn details about many of the people who were aboard 217 and it has helped me, personally, greatly. It’s that time again -49 Years!! Each December 12th, and every day, for 49 years I’ve missed Juanita. TJ, thank you for this sanctuary of sorts. On a different note, I was wondering if anyone wanted to meet for coffee or lunch on December 12, 2018 in NYC in front of the MetLife Building (formerly known as the Pan Am Building). 50 years is a long (and a short) time. Nothing major, just a small gathering; a walk, some coffee, and, perhaps, stories shared. We’ve got some time to think about it. Thank you for reading my suggestion. that’s a great idea, Jill. i hope it happens. Reading this page again today 49 years after the accident. Still shaken by the tragedy and mystery. Still missing my sister Katherine. Another year but for those who lost loved ones time does not heal the pain. Roxanne, I will be pleased to include the memorial that was written for Marianne if you send it to me. As you may have noticed Jill wrote a piece on Juanita which I included. This offer extends to anyone else who would like to write a memorial to anyone that was lost in this tragedy. Jill, with regard to meeting during the 50th anniversary, it is a great idea though I do wonder how many people are likely to be able to make it given the diverse locations. Let us see how things develop as we reach closer to that date. hi, TJ. how do i send the memorial piece ? it’s an image; i used a screenshot to capture it. do i just copy & paste it in this box ? Roxanne, I found the image that you sent me last year and have included it together with your detailed comments last year about Marianne. I have cross-referenced your memories of Marianne together with Jill’s tribute to Juanita on the main post regarding this subject and shown the links as addendums. I hope the idea of gathering by the MetLife building in NYC on 12/12/2018 becomes a reality… I lost my father in the Flight 217 tragedy. I love the idea of paying such a tribute to remember all 51 lost souls, and having the opportunity to share some time with those whose lives were changed after this tragedy. I would like to share with you all my father´s Wikipedia entry… It is only in Spanish for now. Rafael, your father sounds like he was a fascinating person. Thank you for sharing his Wikipedia entry. As for the gathering in NYC next year, I will go for sure. If you, and any one else who wishes and can travel easily to Manhattan, would like to join me, I would be honored to meet you. More details to come, but maybe saying 12 p.m. on the uptown side is enough. I could bring one of the old Pan Am travel bags for ease of identification. Best wishes to all for the holiday and for the new year. Jill, I have few memories of my father since I was only 5 at the time of the tragedy but, according to those who met him, he was a truly remarkable individual indeed. I am sorry, but even after fifty years it still hurts. My mother’s name was Patricia Alice Norgan Haynes. It was definitely not “Clemm” as reported by the NY Times. To Chris: I,too, dread each December Friday the 13th because it was the day I found out and, like you, still, after 50 years, it hurts — even more. I am so deeply sorry for you losing your mom in that horrible tragedy. I so wish someone would come forward who has knowledge of why and who was responsible. I still want to know exactly WHY? ! To Jill: I live in northern CA overlooking Humboldt Bay & the Pacific beyond. While I love your idea of meeting in Manhattan, I can’t even imagine being there with you (not just) because I hate flying more than ever but because I can imagine what the weather could be like and because i’ll be 72 y.o this December 12th and my health is fading. I’ve decided that i’m going to hire a captain & yacht for a couple hours & take 50 or 52 pink roses out to sea and have a little private ceremony to remember my absolutely fabulous friend Marianne and all the other passengers aboard flight 217. In my mind’s eye, I can see each of you carrying 50 roses in Manhattan & leaving them in front of the old PanAm HQ. location with a banner showing a PanAM plane & the names of all the passengers above the flowers. (Maybe you would need permission?) Maybe each of us can take a photo of ourselves on the 12th or 13th commemorating our loved ones lost that horrible day 50 years ago and post the photos on this blog with TJ’s help and permission. What do you think? To Rafael Curra: I look forward to finding your dad’s Wikipedia entry and probably a Google translation. Please help me remember if you are the person who posted the photos from the Venezuela newspaper. That reporting & photos were profoundly moving & helpful even while being deeply disturbing. If it was you, Thank You ! Hi TJ and all. I am a genealogist and doing my grand nephews family investigation I found out that their great-grandmother died in this accident. She was Sophia Kort, Venezuelan, and was in her 40s. Her daughter lives in NY and I would like to inform her about the gathering in NY this coming Dec 2018. Is it possible you keep me posted on that? Sophia’s grandson (married to my niece) lives in Toronto, and may want to be also part of that 50-year family gathering. Much love, and keep the memories alive. They fulfill the spirit. I hope to be there on December 12 to share some time with you remembering our departed loved-ones. I and my sibblings were just babies when tragedy struck our home in 1968. My father was Dr. Rafael Antonio Curra, and he was a college profesor and oceanographer. I currently live in Chihuahua, Mexico, and my sister Luisa still lives in Caracas, Venezuela. My younger brother Miguel passed away nine years ago. Hi @Jill, I lost my aunt, Ana Esther Rodriguez, and my cousin Damaris, who was 4 years old at the time, in that accident. I live in NJ and would love to meet up with you and the other family members of this tragedy. Please let me know how e can get in touch. I received your text. Please keep us posted about December 12 upcoming. Need planning ahead of time especially I would like to bring my mom whose dad died in the crash. @Jill… I would like to contact you to follow up with your idea on the gathering (sent you a message thru Facebook). I created a Facebook Page “Pan American Flight 217-Clipper Malay – New York/Maiquetía – Dec 12, 1968” and also created the event. Roxanne’s idea on taking 51 roses is beautiful. Date set is 12/12, location to be determined, but your idea on meeting close/at the former PanAm building sounds great. @Jill… I would like to contact you to follow up with your idea on the gathering (sent you a message thru Facebook). I created a Facebook Page “Pan American Flight 217-Clipper Malay – New York/Maiquetía – Dec 12, 1968” and also created the event. Roxanne’s idea on taking 51 roses is beautiful. Date set is 12/12, location Manhattan, NY, specifics: to be determined, but your idea on meeting close/at the former PanAm building sounds great. Just to let you know that I will not be able to make it for the 50th anniversary since I expect to be out of the country. But my thoughts will be with you and others who gather on this anniversary. I am sorry that TJ, the originator of our connection so many years later, won’t be able to make the 50th anniversary gathering! Nevertheless, we must forge ahead, reporting afterward to all who cannot go. I suggest meeting at the northeast corner of the MetLife/PanAm building at 12 p.m. We could figure out the next step from that point since there are many restaurants in the area. If anyone would like to offer more detailed plans, Lizzie Lee has set up a FB page (see above), where ideas could be shared in relative privacy. Lizzie, you can reach me through the “contact me” link that appears on the blog. Sorry about the blog being down – quite honestly, I was not aware this had happened or for how long it has been down. It was a problem with the company that hosts the blog and they fixed it. Jill, sorry I can’t make the get together in NYC. If my travel plans change – unlikely – I will let you know. TJ, used the “contact me” link. Let me know if you got it. Lizzie, I did not receive your communication and so I have made contact with you directly by email. Well, we’ve reached that milestone 50 years since we lost family or friends. Thanks again to Rana for creating this page. I guess we will never know what really happened but it is nice to see that there is more interest in this story in recent years. There is going to be a small gathering in New York later today and although I live in England I won’t be able to go thanks to Lizzie Lee for organising the meeting and creating the Facebook page for this sad event. Yes Brian and others a half century has passed since this tragedy. I am sorry that I am not able to join the get together in NY because of my schedule but thanks to Lizzie Lee and Jill for taking the initiative in organizing it. If anyone attending the gathering wants to email a narrative (including pictures) of what transpired I’d be pleased to include it on this blog for the benefit of those who were not able to be present.